Raksha Bandhan is here, guys! Check out these offbeat, pompom Rakhis starting INR 10. There's also a customised Rakhi hamper for your sister! If you're looking for pocket-friendly, quirky Rakhis that can say “love you bro”, Swankrith is here to help. They design Rakhis that will perfectly fit your bro's persona. Want something not too flashy yet unusual? Then go for the pompom Rakhis starting just at INR 10! Their unusual collection has a Rakhi that is made with artificial flowers. Are you brothers confused about what to give your sisters as return gifts? They have a solution for that as well. 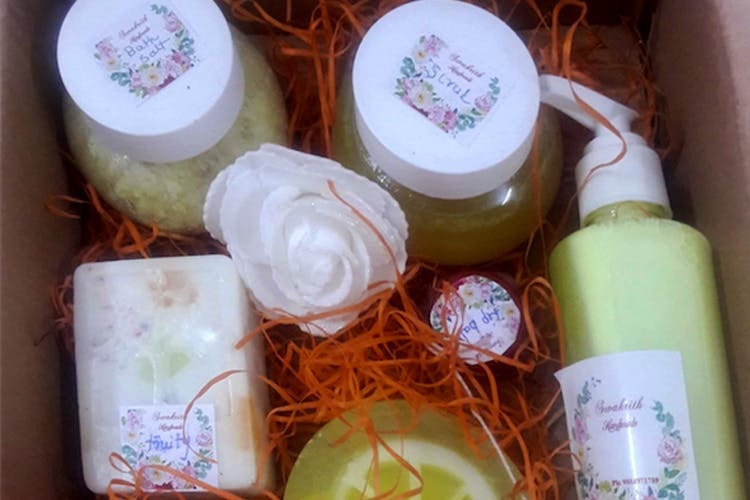 This place offers Rakhi hampers that has handmade soap, moisturiser, lipstick, and sugar scrubs starting INR 300! Not a big fan of lipstick? Well, you can customise your own hamper! Time’s running out, so call 9884971789 to buy your Raksha Bandhan gifts!